Herbs, perennial, cespitose, rhizomatous. Culms trigonous, 7-30 cm × 0.5-1 mm, glabrous. Leaves V-shaped to flat, 5-20 cm × 1-2.5 mm. Inflorescences: spike hemispheric, 7-20 mm wide; rays absent; rachis 1-3 mm; bracts 2-3, reflexed, flat, 5-12 cm × 1-2 mm; rachilla deciduous, wings 0.2 mm wide. 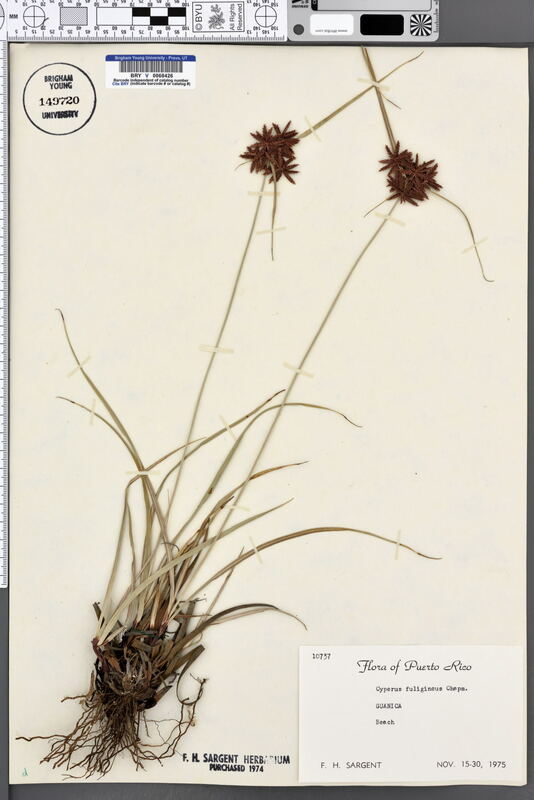 Spikelets 30-50, compressed, oblong-lanceoloid, 4-10 × 1.7-2.3 mm; floral scales deciduous, 5-12, dark reddish brown, laterally 3-5-ribbed, ovate, 1.5-2.2 × 1-1.6 mm, apex with mucro 0.1-0.2 mm. Flowers: anthers 0.4-0.6 mm; styles 0.4-0.6 mm; stigmas 1-2 mm. Achenes black, sessile, narrowly ellipsoid, 1-1.2 × 0.5-0.6 mm, apex obtuse, apiculate, glabrous, puncticulate, or papillose. Fruiting spring-summer. Coastal rocks, exposed limestone in hammocks and edges of mangrove swamps; 0-10 m; Fla.; West Indies.